As you likely know, one of Safe-T-Cover's highest concerns is safety. It's right there in the name, folks. Safety along with education are two of our top priorities. That's why we recently held a panel discussion webinar on below grade utility vaults. The panel was led by Safe-T-Cover's Cary Wiley, someone that's been in the backflow industry for more than two decades and has experience with the devices themselves and with all kinds of installation practices. He's met with countless water managers, engineers, and others in the wide world of waterworks. Joining him as panelists were representatives from different specialties in backflow. Joe Gildersleeve has served as Water Resource Manager for Arlington, TX for 12 years. Chris Mayhew owns Backflow Services Inc., and has been a tester and instructor for more than 10 years. Sean Cleary is VP of Operations at IAPMO and has been in the industry for 34 years. The knowledge and experience these three gentlemen possess made for an exciting discussion. In case you missed it, here are some key takeaways. In a few municipalities, such as Arlington, irrigation can be classified as low hazard and can be protected with a double check valve. However, for most of the US, irrigation is considered high hazard and therefore requires a reduced pressure zone device (RP) which can't be installed below grade. In addition to irrigation, municipalities across the US are increasingly installing RPs on all domestic service lines as well. The primary exception is fire protection lines. Mayhew says that about 90% of the vaults he runs into are for fire protection. What's interesting is that fire protection lines are considered high hazard if they are using chemicals such as glycol or other forms of anti-freeze. If the design engineers do not specify RP or RPDA in the planning stages, then the standard DC or DCDA in a vault will be incorrectly installed and the water supply will not be sufficiently protected. The owner may decide at a later date to include chemical fire protection, and water managers and fire marshals may not even be aware of the increased danger. One attendee commented on this problem and told us that in Connecticut, fire lines are all considered high hazard because of this. We think that's a smart solution and other areas should take note. Repeatedly, the upfront cost of a vault vs the upfront cost of an enclosure was brought up. Our own findings have shown that enclosures actually cost less, but this of course varies across the country. The panelists agreed that contractors typically say cost is the reason to choose below grade solutions over above grade solutions. 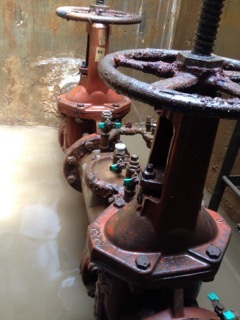 The increased cost is partly due to having to bring the piping above grade for the backflow preventer then back below to continue into the building. However, the panelists noted that backflow valves degrade faster in vaults because they are subjected to flood water repeatedly over time. Additionally, some testers, including Mayhew, charge more for testing in vaults because of safety concerns and extra time typically required. He also explained the costs associated with bringing out a team to pump out flooded vaults, and how owners are charged for the time lost to pumping them out. 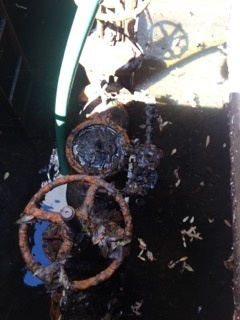 Testing a backflow in an enclosure, he says, takes much less time and the safety concerns are practically nonexistent. Arlington currently has a project retrofitting a few hundred single check valves to double checks. The single-checks are installed in vaults, and the city is going to install the new double checks in the existing vaults. This does make sense, as they won't have to consider the cost of vaults or enclosures, and only need to pay for the new valves and labor. However, they may have benefited by choosing to move above ground in the long run. Only time will tell. Other municipalities are moving in the opposite direction and retrofitting their double check valves in vaults to above grade solutions. One example is the Las Vegas Valley Water District, and you can read about their program here. Intrigued? Watch a recorded version of this vault panel with captions here. Vaults More Dangerous Than We Thought? OSHA is clear on what defines a confined space. All below grade vaults for backflow preventers are considered a confined space causing testers and maintenance personnel to take extra precautions when working in them. The common concerns surrounding utility vaults are that they'll be full of water and contain dangerous animals or insects. It's common sense that the ladders which have been covered in flood water can be hazardous as well. 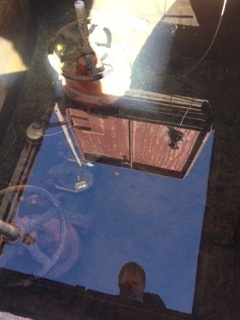 OSHA is also clear on what defines a permit-required confined space. Unfortunately, this language seems to be up for interpretation and has led to many municipalities choosing not to consider their backflow vaults permit-required confined spaces. Since there are no permits or signage, some testers don't take all the precautions they should when entering vaults. For instance, many don't use equipment to test for hazardous atmospheric conditions or enter with both an attendant and entry supervisor present. Most testers do only climb up or down ladders with at least one other person present. As someone extremely familiar with the Uniform Plumbing Code and with the relevant OSHA definitions, Sean Cleary urged testers to treat all vaults as permit required confined spaces. He stressed the danger of entering without various types of equipment and without a team ready to assist. None of our panelists had a solid answer for how to remove backflow vaults as an installation option. They each said that it will take a change in the codes, a change in upfront cost, or a universal change to RPZs. Over the past few decades we have seen a large change towards requiring RPZs on more water lines where double checks used to be sufficient, but we're still far from requiring them across-the-board. It's still difficult for many to see that the long-term cost of equipment may be more important than the upfront cost, so we likely won't see much change on that front any time soon either. A change in regulations will likely have to outlaw underground backflow preventer vaults altogether. Mr. Cleary suggested that may happen but it likely won't happen anytime soon. He worries that change regarding vaults will only come as a "tombstone regulation," meaning the status quo will only change after more people have died.